Yes, I have FINALLY pulled my finger out of my wotsits and have put up a new gallery of pictures! A couple are from our recent trip away but most of them were taken at home over the last couple of weeks! We’ll put up another post soon with more details about our mini holiday but for now, enjoy the photos! Isabel12/DSCF0014.jpg Click the photo on the left to go to the gallery. To crawl or not to crawl…. Well, it’s been just us girls this week and we’ve been pretty busy but still haven’t persuaded Isabel to move forwards! Monday was a dress fitting and then Sarah and Henry came for lunch – being 2, Henry got a bit restless in the afternoon so we packed up and moved to the park round the corner to let him run off a bit of steam! Tuesday we cleared up the bomb site that was the kitchen and then went for a walk with Jody and Madeleine – it was so hot that I got horribly sunburnt so I’m now being careful and have swapped my t-shirt for a long sleeve polo neck….good job it rained today or I’d have boiled! Erica came for dinner in the evening which was lovely. Wednesday was antenatal get together at Lisa’s – Isabel is still one of the most advanced in the group being the only one with teeth and the only one threatening to move but Arabella has beaten everyone by being the 1st to sit up! After that, Sarah and Henry came for a brew before picking Tim up from work and then Rachel came round for a brew or 2 and a chat before picking Paul up from football! So we have taken the chance today to do bugger all and have chilled out at home (the rain helped in this decision!) and I have booked some accommodation for us to go away for a few days at the end of next week – we’re heading up to Taupo for a change of scenery and we are really looking forward to it! Tomorrow we are going to get the fabric for the wedding dress I am making and then the plan is to go and see Charlie and Anna at their new house before shooting home to make sure everything is beautiful before Dan gets home at 6.30! We thought Isabel wasn’t bothered about solid food yet as she never seemed that interested in the things we were giving her but today we have discovered a flavour of baby food that she loves – Pumpkin and Sweetcorn of all things! 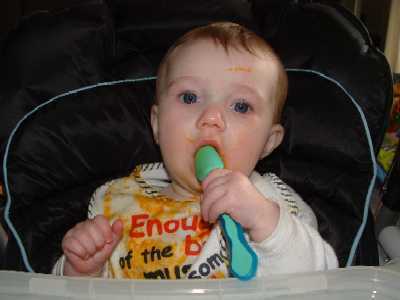 We have supplied a pic of her happily tucking into her dinner – you can see just how much she liked it by the state of her face (her bib only got that colour because I used it to clean her face at least twice before this pic was taken!) so I’ve added it to my shopping list for today to make sure we have plenty in the cupboard! Still no forward motion in the crawling department – we have had some progress in that Isabel now gets up into full press-up mode, brings her knees in and forwards and then collapses on her face! This doesn’t seem to be bothering her much – it would bother me if I was landing on my face so regularly, but small people are clearly much more resiliant to these sorts of things! Busy week ahead of us next week – Dan is off to Auckland for the whole week so it’ll be a girly fest here! We have another fitting for the wedding dress I am currently constructing, antenatal get together, trips out to the beach and people coming for lunch, dinner and we may add some breakfast into the mix! So, all in all, a busy schedule that we are looking forward to! The weather has been a bit dodgy of late – has a cunning way of lulling you into believing it will do one thing, and then doing the complete opposite! Last Saturday is a good example – peered out of the window before getting myself and the Munchkin dressed to find clear blue skies and glorious sunshine! Summer attire was chosen, put on and we headed into town so Dan could have his hair cut. By the time we got into town, the wind was howling, sky was black and it was starting to pour with rain…..and nobody had a coat! Anyway, the last couple of days have been lovely and pretty consistent so fingers crossed for a reasonable weekend – not sure we’ll get chance to road test the new Munchkin carrying contraption but we’ll let you know and provide pics if we do! This weekend, we bought Isabel a new Phil & Ted’s “Escape” Backpack carrier. She’s getting a bit big for her front pack now (even though, in theory, she could weigh a lot more and still be carried around in it!) and we decided that it would make trips out and holidays a much easier experience – especially when taking her buggy is not an option! We’ve yet to try her in it – we tried her in it in the shop but haven’t had a chance to go out properly for a test run….roll on next weekend and any weather you can throw at us as we can test the storm hood as well then! We also think that she is getting 2 teeth at once – it feels as though both her front, bottom teeth are coming through at the same time! 2 for the price (and pain) of 1 – what more could we possibly want! Much to our surprise, we came home from a lovely day out and evening at Paul and Rachel’s house to find the garage door WIDE OPEN – and given we went out at about midday, it had been like that for just short of 12 hours! Luckily, everything seems to be where we left it – aside from the stuff that Nigel decided to tip on the floor but there’s nothing unusual about that! Today we have had a date through for Isabel’s operation. We are still none the wiser as to how long we will have to stay in hospital etc so will probably go to our 1st appointment with a GIANT list of questions but that’s ok as the letter says we should feel free to ask questions at any point. Once we know some more, we’ll let you know!